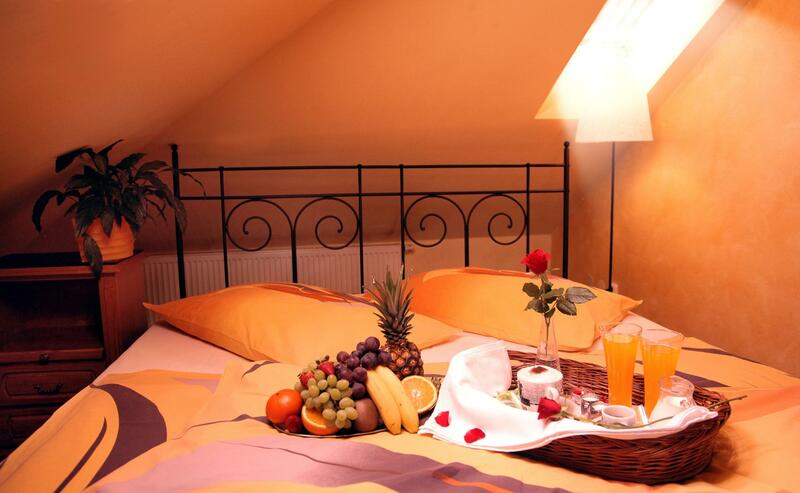 Accommodation | Mahlerův Penzion "Na Hradbách"
Do you want to stay in the heart of the old town? Come to Mahler's Guesthouse. 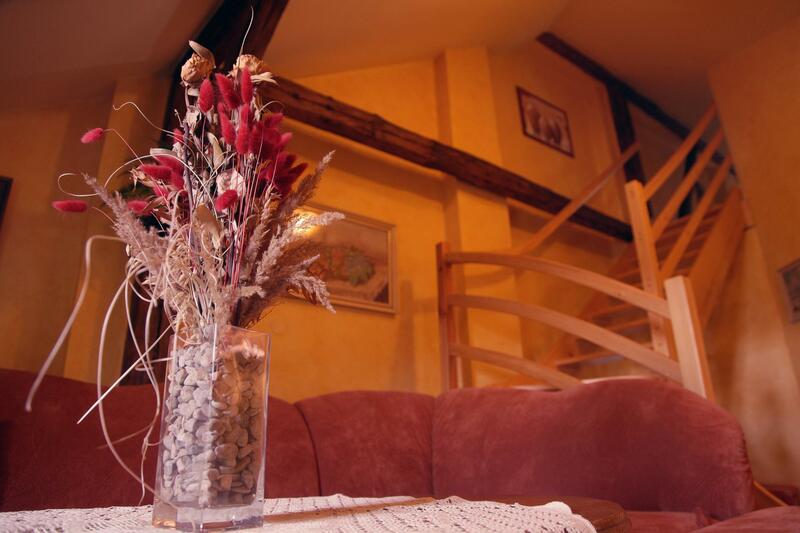 Comfortable accommodation is waiting for you in the friendly and cozy atmosphere of the family guesthouse. Each of our 19 rooms has its unique, unforgettable atmosphere. Guest rooms are spread over two buildings. The first, historic building is situated in a rustic style. The basement features a stylish restaurant and a dining room with a tiled stove. 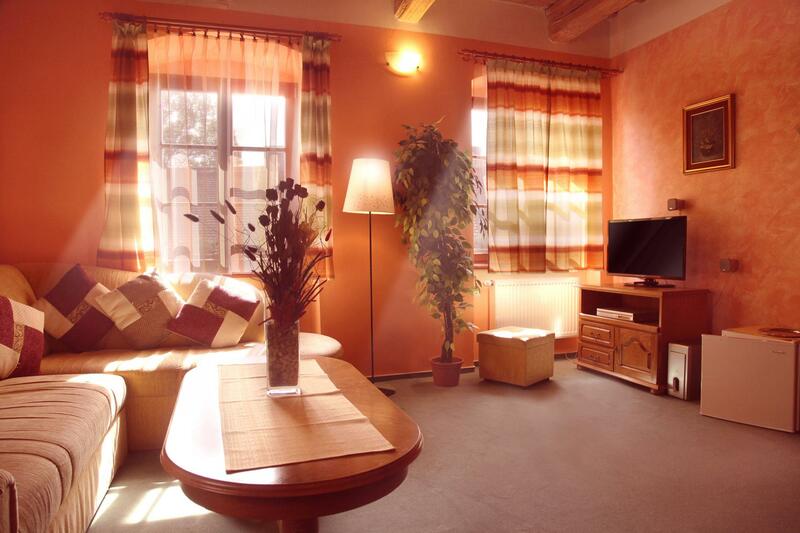 On the other two above-ground floors you will find two single, two double rooms, three small and two large apartments. The second building dominates modern style. 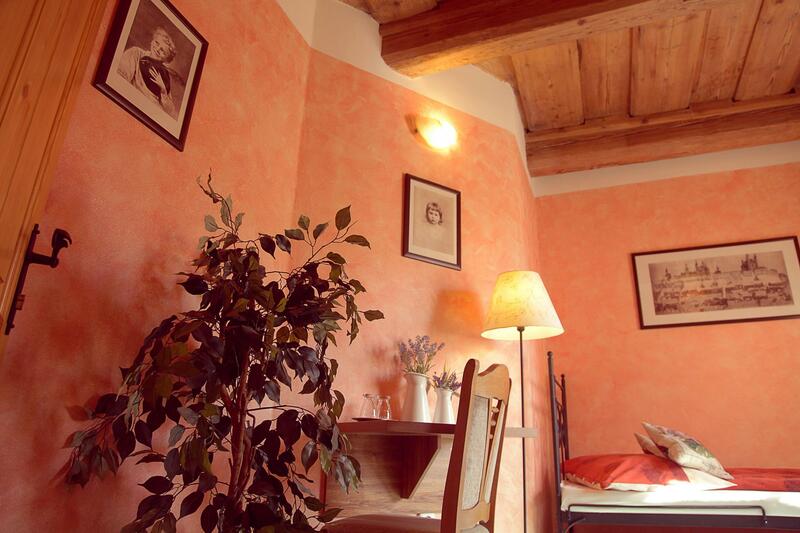 On three above-ground floors, we have two triple rooms, five double rooms and one single room. In the basement of the building you will be pleasantly surprised (excited) by the luxurious Wellness Center. Each room is equipped with bathroom, refrigerator, SAT, TV and free high speed wifi. The capacity of the pension is 45 beds and 11 extra beds. We generally accommodate up to 56 adults. A rich breakfast buffet is served in the rustical dining room with a tiled stove. For breakfast we offer both hot and cold dishes. We allow guests to book rooms on the day of arrival from 2pm – 9pm. On the day of departure we request leaving the room until 10am. Later arrivals and departures are solved individually. WE DO NOT HAVE A NON-STOP RECEPTION SERVICE. MONDAY - FRIDAY: 7am – 5pm 1 hour FREE OF CHARGE after installation of the Blue zone PARKING CARD in the vehicle, in the evening and night hours FREE OF CHARGE. At the reception, we have special deals and can extend your parking at nights or working days until 4pm. 2) Mahler's guest house has its own parking space. It is about 200m away from the premises of the former factory under the Brno Bridge. The parking lot is locked at night and the key from the gate is part of the room key. You can park for FREE during the entire stay. EET: Under the Sales Records Act, the seller is required to issue a receipt to the buyer. At the same time, he is required to register the received revenue with the tax administrator online; in the event of a technical failure, within 48 hours at the latest.